You will love this list of 25+ Free Online Games Websites! If you are a parent you may love or hate me for this page, because once your child discovers all of these free games, you may have to pull them away from their computer, device or phone occasionally! As you know, games are not just for the young. They are also for the young at heart. And, games are great for keeping your mind sharp as you age. Plus, most of these sites have games for all ages! Yes, even AARP offers a game page, and I've listed it below. The sites that have hundreds or thousands of free games will let you play the games to completion. Most however, will make you sit through a short ad/commercial prior to playing each game. Advertising pays for many of the free things that we enjoy. Some of the larger video games that I list below will let you play all the way through, and some will only let you get to a certain level before they want you to pay. If you gamers know of any great free sites that I haven't listed, be sure to shoot me an email and let me know about them. Keep your brain sharp as you age by playing games. Bring your A Game. Watch a brief commercial, the game you selected loads, then you play! So many games to choose from! Lots of free online games! Online games to beat the band! Just as the name implies, they have hundreds of free online games! You must sit through an ad before you can begin playing. Like with many of these sites, you have to sit through a commercial prior to playing your free game. A bunch of free games. They have tons of free games to play! A site that allows you to play over 100 Free games. 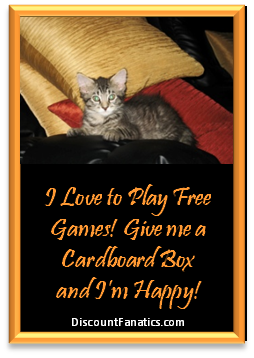 Go to lower half of page to see free games available. This site has 11 pages of free games! They have over 1800 games. Do you own an Xbox? Well, Xbox offers you tons of free video games that you can download! Oh yeah!!! They're rated by stars so that you can see if the gamers like the game, and you can see how many people have already downloaded the game. Go get your free video games! I've already put in the search criteria, so that the free games will come up, but they still sprinkle in a few paid games. Just scan down the page for the word "FREE." IGN offers a different Free Game of the Month each month for you to play! Since there is no one page to go to in order to access the free game, I have automatically taken you to the search for the "free game." Simply look for the current month's/most recent Free Game of the Month - which will usually be the top listing (or near the top). One way to get cheap video games is by buying used video games at pawn shops. They sell used video games for .99 cents to a few dollars. Sure, it won't be the latest release, but if that's not a major concern for you, you can save tons of money! Big Fish Games offers new members either 70% off their first PC game, or sometimes they'll switch it up and offer something like $2.99 for your first game. It's a great deal! Take advantage of it even if you only get one game. You can get the latest in gaming from them, plus score some great deals, especially during their sales! They also offer many free games that I tell you about. Amazon frequently offers deals and discounts on video games! The deals change frequently.